FRASER, PETER, merchant, magistrate, politician, and militia officer; b. 23 Sept. 1765 in Forres, Scotland, son of James Fraser, a merchant, and Jean Rose; m. Maria Berton, daughter of James Berton, an American loyalist; they had no children; d. 13 Aug. 1840 in Fredericton. Peter Fraser arrived in Fredericton in 1784 and established himself as the leading trader on the upper Saint John River, where he gained the confidence both of the Indians and of the French-speaking settlers in the Madawaska region. Fifty years later William Teel Baird* described him as “a buyer and exporter of peltry, perhaps the principal one in the Province.” In 1789 he bought one of the most desirable riverfront properties in Fredericton, where he built a wharf and a store. As an importer and agent he encountered several leading loyalists, including Edward Winslow*, with whose family he became intimate. 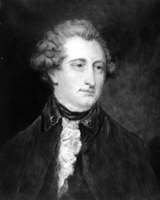 In 1801 he was in partnership with members of two other prominent families, George Ludlow and John Robinson*. This partnership was dissolved in 1806, but Fraser maintained a connection with the Robinsons for the rest of his life. In the general election of 1802 Fraser and his neighbour and fellow Scot Duncan McLeod stood for York County in opposition to Archibald McLean*, Stair Agnew*, John Davidson, and Walter Price, all of whom supported the policies of Lieutenant Governor Thomas Carleton*. When the sheriff reported that the lieutenant governor’s candidates were at the head of the poll, Fraser and McLeod, alleging irregularities, appealed to have the election declared invalid but lost, the deciding vote in the assembly being cast by James Fraser*, with whom Peter was connected in business. This vote was of critical importance to the lieutenant governor’s faction, for it enabled them to seat members of their own group in other disputed elections and then to dominate the committees that controlled the business of the house, thus ending the political influence of James Glenie*. In the election of 1809, however, Fraser was returned along with McLeod, and on 1 March 1810, soon after the session opened, he asked leave to prepare a bill to secure Roman Catholics in the exercise of the franchise. His action led to the passing of a measure abolishing the requirement that electors must, if called upon, take the state oaths before being allowed to vote; in their place the new act exacted a simple oath of allegiance. In 1802 French-speaking Madawaska settlers had protested when they were denied the opportunity to vote, and their petitions had been looked upon as being in support of Fraser and McLeod. Fraser continued to be returned for York County until 1827, when he retired upon his defeat in the election of that year. Throughout his years in the house Fraser consistently voted against measures designed to strengthen the role of government officials, notably during George Stracey Smyth*’s régime, but also in 1825 when he opposed a bill, strongly recommended by Lieutenant Governor Sir Howard Douglas*, to provide funding for circuit courts. In 1821 he joined with the majority, in a close vote, to support a bill that, had it not been rejected by the Council, would have extended the authority to solemnize marriage to all ministers authorized to preach. Essentially, Fraser was an 18th-century British whig, independent in his judgements but prepared to work within the existing system. In 1808, while Winslow was administering the government, he accepted appointment as a justice of the peace, and he also served a term as warden of the Anglican parish church in Fredericton. Although he seems to have had no military experience, in 1824 Fraser was appointed major commanding the newly formed 4th Battalion of York County militia, made up mainly of French-speaking inhabitants of the upper Saint John valley. The establishment of this unit in territory in dispute between New Brunswick and Maine was no doubt intended to confirm that most of the settlers acknowledged the New Brunswick government. Fraser was highly knowledgeable about this area. He owned a number of properties there and his business interests had included the supplying of both British and American parties engaged in the boundary survey from 1817 to 1820. He gave evidence in May 1828 at the trial of John Baker for sedition, conspiracy, and combination, a case in which New Brunswick asserted its authority in the Madawaska region [see Sir Howard Douglas]. Fraser retained his command when, in 1831, the upper part of York County was erected into a separate county and the 4th York Battalion was remustered as the 3rd Battalion of Carleton County militia. Fraser was a sponsor of the Bank of New Brunswick on its incorporation in 1820 and served as vice-president in 1832. When the Fredericton Savings Bank was organized by Sir Howard Douglas in December 1824, Fraser was named vice-president, and a few weeks later was made a member of the committee to report on a site for the College of New Brunswick. Like many assemblymen in that era, he also acted as the supervisor of several roads. He was the first president of the Fredericton St Andrew’s Society and presided over its convivial gatherings until 1832. He also served as a justice of the Inferior Court of Common Pleas. In 1831 the administrator, William Black*, recommended that he be made a member of the Council of New Brunswick, but the Colonial Office preferred to appoint men from sections of the province that were not already represented. Although Fraser appears to have been regarded early in the century as a significant merchant by provincial standards, and there is no evidence that he suffered any serious reverses, by the 1830s his business and his estate were modest in comparison with those of a number of Saint John entrepreneurs. His house, which survives in Fredericton, was a combined dwelling and store, and when completed around 1816 was one of the largest privately owned buildings in the capital. “Canoes, bateaux and scows came and went continually,” says a local historian, who also notes that Fraser entertained a great deal. Among his properties were a large farm and several of the most desirable intervale lots in the countryside. He died on the eve of an economic depression which reduced the value of his estate to about £8,000. It took almost three decades and an act of the legislature for his executors to settle his affairs. ACC, Diocese of Fredericton Arch., Christ Church Anglican (Fredericton), records (mfm. at PANB). GRO (Edinburgh), Forres, reg. of births and baptisms, 29 Sept. 1765. PAC, MG 11, [CO 188] New Brunswick A, 44/1: 194; MG 23, D1, ser.1, J. Johnson to Ward Chipman, 7 Aug. 1817. PANB, RG 4, RS24, esp. S16-P2, S16-P4, S16-R8; RG 7, RS75, 1840, Peter Fraser; RG 10, RS108, Peter Fraser, 1816, 1825. UNBL, MG H2, vols.11–12, 15–16, 30–31, 36; UA, “Minute-book of the governors and trustees of the College of New Brunswick,” 1800–28. York Land Registry Office (Fredericton), Registry books, 1: 224, 311, 508 (mfm. at PANB). W. T. Baird, Seventy years of New Brunswick life . . . (Saint John, N.B., 1890; repr. Fredericton, 1978). [Ward Chipman], Remarks upon the disputed points of boundary under the fifth article of the Treaty of Ghent, principally compiled from the statements laid by the government of Great Britain before the king of the Netherlands, as arbiter (Saint John, 1838). N.B., House of Assembly, Journal, 1793; 1803; 1809–27, esp. 1810: 14, 19; 1821: 336; 1825: 60–61. Royal Gazette (Saint John; Fredericton), 1803–40, esp. 27 June 1820, 21 Dec. 1824, 12 May 1828, 19 Aug. 1840. Saint John Gazette, 26 May 1806. The New Brunswick militia commissioned officers’ list, 1787–1867, comp. D. R. Facey-Crowther (Fredericton, 1984). I. L. Hill, Fredericton, New Brunswick, British North America ([Fredericton?, 1968?]). John Garner, “The enfranchisement of Roman Catholics in the Maritimes,” CHR, 34 (1953): 203–18. D. M. Young, “FRASER, PETER,” in Dictionary of Canadian Biography, vol. 7, University of Toronto/Université Laval, 2003–, accessed April 24, 2019, http://www.biographi.ca/en/bio/fraser_peter_7E.html.